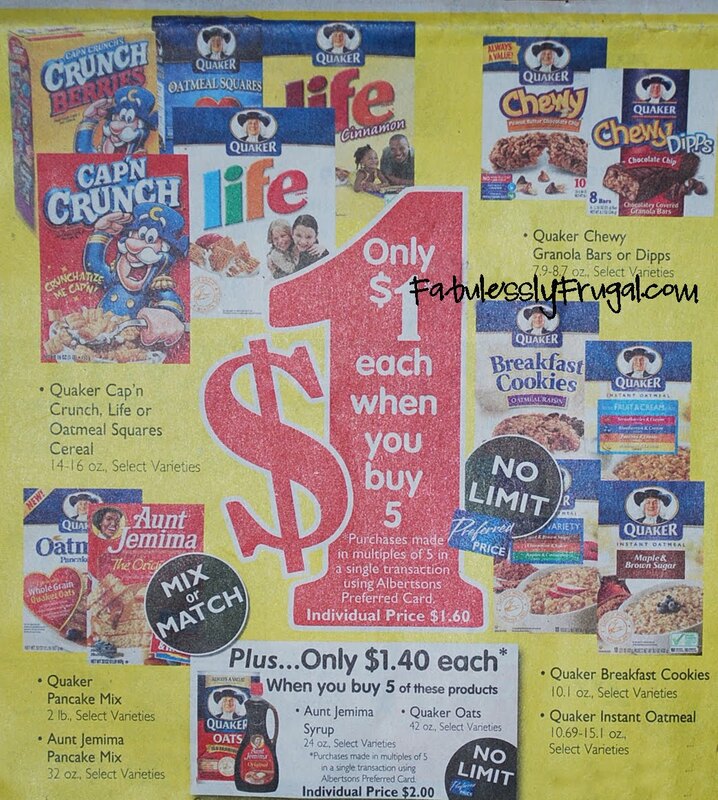 Each item is $1 when you buy in multiples of 5 (Quaker Oats are $1.40 each). Get ready for your local store to be cleaned out early in the week. There are several coupons that match with this sale in the 1/3 RP insert. If you want to buy more items than you have coupons, head over to ebay and buy some! Find more about buying coupons off ebay before you make your first purchase. WAHOO! $1/1 printable Quaker coupon!! Read more at hip2save. I was able to print 2! The Perera's: The $1/2 coupons are for "any granola bars." I just bought some off ebay. Maybe we didn't get these in Portland. Wow, what a sale! Dare we hope for doubles next Sunday??? The granola bar coupon is for certain items and it's not what's in the sale ad picture. I don't think it would work. Will Albertsons ALWAYS give a raincheck for these types of sales? Cause EVERY time I go to Albertsons for one of their deals they're out…and I don't have time to do that all the time. Thanks for the link Megan! I have been waiting for a sale on maple syrup. My husband bought me a new waffle maker for Christmas, which I have been begging for and he can't understand why we haven't had waffles yet. I just can't bring myself to pay full price for syrup. 🙂 Yay for homemade waffles in the near future! There's also a $1/2 granola bar coupon on RP's site which you can print twice. Here's a coupon for $1 oatmeal making it FREE!! I could only print it once though. Wow..amazing sale…we love oatmeal around here so I will definatly be stocking up..Thanks so much for posting!